Wattle Day is a popular Australian holiday celebrated on September 1, which is the first day of spring in the Southern Hemisphere. This is a time when several wattle (acacia) species are in bloom and many people wear a sprig of wattle to celebrate the beginning of spring and as a sign of patriotism. The origins of Wattle Day date back to 1838. That year, the first Hobart Town Anniversary Regatta was held to celebrate the anniversary of the discovery of Tasmania. Its organizers decided that the annual regatta should be celebrated by wearing a sprig of silver wattle blossom. However, their proposal was met with some ridicule as this wattle species blossomed in August and September and would be difficult to obtain in November or December, when the regatta took place. As a result, it was decided to use the black wattle instead. This custom persisted until at least 1883. In 1899, field naturalist A. J. Campbell established a “Wattle Club” in Victoria. For several years the club organized bush outings to celebrate the beginning of spring. Campbell officially suggested that Wattle Day be celebrated annually in 1908. The first celebration took place in 1910 in Melbourne, Sydney and Adelaide. For a long time, acacia was the unofficial symbol of Australia. 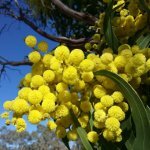 The golden wattle was made the country’s official floral emblem in 1988. Four years later, then Governor-General of Australia Bill Hayden designated September 1 as National Wattle Day.